Today Hallandale importer Gold City Enterprise issued a recall of the following toothpastes made in China because they may contain the poisonous chemical diethylene glycol. Around 170,000 tubes are said to be affected, it was reported that the thickening agent used in the toothpaste was substituted for diethylene glycol (DEG), a thickening agent used in antifreeze. If you have any of this toothpaste stop using the products and throw them away, or return them to the stores where they bought them. 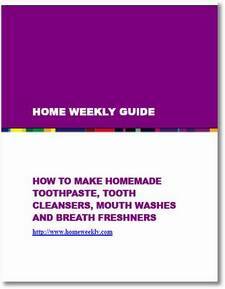 Home Life Weekly has put together a simple guide to make your own toothpastes, mouth wash, breath freshners for just $1.99 Visit the Homelife Weekly Shop..